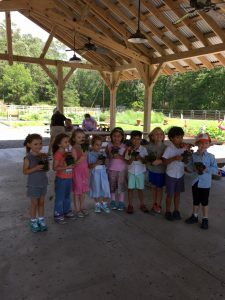 Pre school visit to the Farm May 1st. On May 1st we had 26 visitors from the Presbyterian Preschool Program. A fun garden discovery tour with Farmers Jane, Carol and Jill was the first order of business! Following the tour a picnic in the pavilion 😊. To top off the field trip, the children potted a plant to give to Moms for Mothers Day. A good time was had by all!